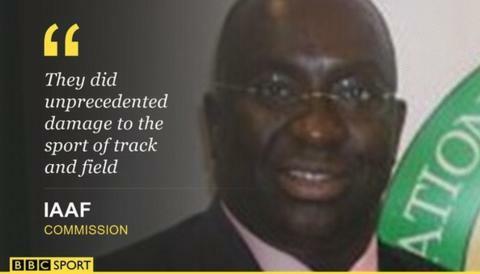 The son of ex-world athletics chief Lamine Diack is one of three senior figures given life bans from the sport. Former IAAF consultant Papa Massata Diack and Russian officials Valentin Balakhnichev and Alexei Melnikov were last month charged with multiple breaches of anti-doping rules relating to Russian athlete Liliya Shobukhova. Ex-IAAF anti-doping director Gabriel Dolle has been banned for five years. IAAF president Lord Coe said the bans "could not send a stronger message". Diack and Balakhnichev, a former president of the Russian athletics federation and IAAF treasurer, face fines of £17,000 while Russian coach Melnikov could be fined £10,000. The independent IAAF ethics commission panel's 170-page report claims Diack, Balakhnichev and Melnikov conspired to "blackmail" Shobukhova to cover up her doping violations by her paying them "bribes" of about £435,000. Last month, Diack told the BBC he "totally rejects" the blackmail allegations, saying: "There was no extortion of funds from any athlete." The panel said: "The head of a national federation, the senior coach of a major national team and a marketing consultant for the IAAF conspired together (and, it may yet be proven with others too) to conceal for more than three years' anti-doping violations by an athlete at what appeared to be the highest pinnacle of her sport. "They acted dishonestly and corruptly and did unprecedented damage to the sport of track and field which, by their actions, they have brought into serious disrepute." Shobukhova's 38-month ban from track and field was reduced by seven months after she turned whistleblower for the World Anti-Doping Agency (Wada). Russia have been banned from international athletics competition after a report by Wada's independent commission alleged the country was guilty of "state-sponsored doping". There is an old rule of journalism that you should always get the name of the dog in any story about a domestic tragedy or natural disaster - the idea being it is the pet with a cute name that really grabs your audience. There should be an amendment to that rule for this golden age of sporting scandal: get the name of the dodgy bank account. In the case of the scam to suppress positive drug tests by Russian athletes in return for cash, it is called 'Black Tidings'. How apt for a grim tale that involves drugs, mysterious meetings, blackmail, a cosmopolitan cast of pantomime villains and the Olympics. The weirdest thing about reading the 170-page into how the IAAF president's son and two leading Russian officials colluded to extract huge sums of money from a drugs cheat - while Dolle, the IAAF's anti-doping boss, looked at his finger nails and whistled - is you almost feel sorry for the cheat. Almost. The most alarming thing for athletics is this report - into one scam, involving one athlete - will be the mildest indictment of the moral malaise at the sport's heart in the coming weeks and months. There is far worse to come, which the report hints at with references to other athletes, other officials and other countries. Black tidings indeed.